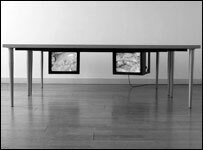 The Two monitors are attached underneath a large table. They show different images of ‘flesh-structures’, moving on the breath-rhythm of a speaker or a singer. There are always two persons audible at the same time (left and right monitor). All images are manipulated (time-stretched) in a way that the breathing, in-between the spoken or sung text parts, takes place at exactly the same time. On a irregular basis either on the left or the right monitor changes take place , in which the image is replaced by a different structure and in which at the same time another text or song is performed, often in a different language.